Question: I am a new fly fisher, using hand-me-down gear. The handle on my reel is on the left, which feels uncomfortable to me, but a couple folks have told me that I shouldn’t reel with my right hand if I cast with my right. Is this true? And if not, is it hard to switch the reel from left to right retrieve? Answer: As a lifelong right-handed caster and retriever, I am outraged that you have been subjected to this kind of abuse. Okay, maybe not outraged…perhaps mildly annoyed. You should reel however feels the most comfortable to you. You are not compromising any part of the fishing experience by using one hand or the other. I have heard a million times over the last 25 years that I shouldn’t reel right because (gasp!) I have to change hands on the rod every time I need to reel in. This is ridiculous for three reasons. First, how often during the course of a day of trout fishing do you actually get a trout on the reel? (Okay, in saltwater this one doesn’t apply.) Second, if you’ve ever watched a Saturday-morning bass-fishing show, you may have noticed that most baitcasting anglers switch hands after every single cast, and it doesn’t seem to bother them. And third, the millisecond it takes to shift the rod from the right to the left hand isn’t going to cause you to lose any fish. Oh yeah, and here’s a fourth reason: Shut up and mind your own business, Mr. Fly-Fishing Rules Man. 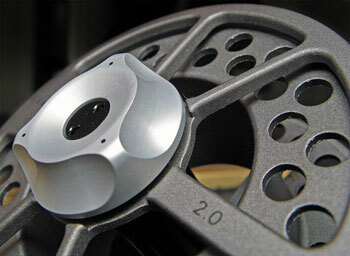 That said, most fly reels come set up for left-hand retrieve, but changing them to right-hand retrieve is usually a snap. If you have the manual for the reel, the directions are in there. If you don’t have the manual, go to the manufacturer’s Web site to see if you can download a new manual. If you still can’t figure it out, take the reel in to your nearest fly shop, where they’ll surely do it for free. (Don’t forget to buy something you need as part of the bargain.) Then go fishing, and don’t listen to the “leftists” who comment on your new, more comfortable setup.